Light & Fresh but Filling! Recipe adapted from Cooking Light, they are super easy to make (especially with my latest obsession the Cuisinart Compact Deep Fryer… who knew I’d be such a fan?? ?– not sponsored). I have made these in the past with a cast iron skillet equally well. We made them with tilapia, a very light, flaky fish. The tilapia were deep fried after being lightly coated with egg whites and Gluten-Free GF Jules All Purpose Flour mixed with garlic powder, onion powder & red pepper. Super tasty! 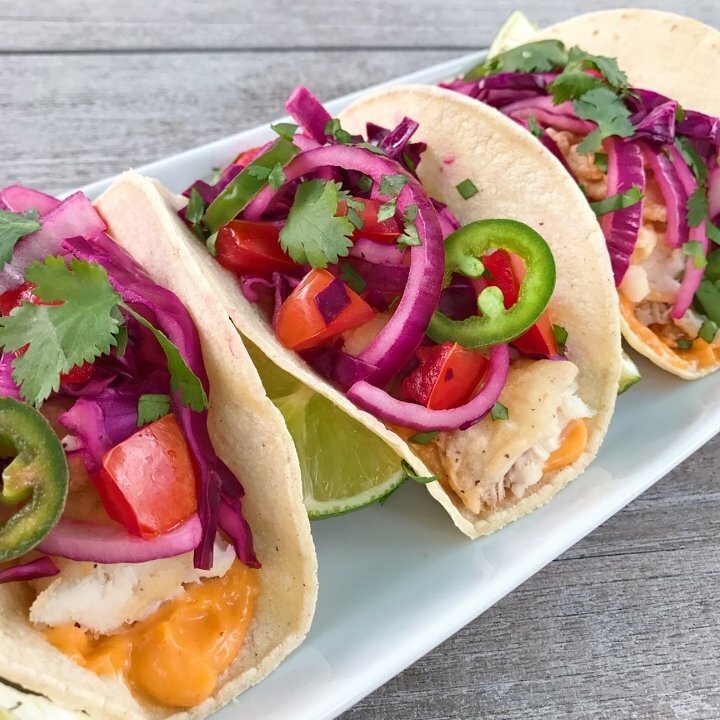 The cabbage-onion-tomato slaw made with fresh lime juice is super fresh and a great contrast to the crispy fish and Sriracha aioli I added to the mix. Click here for recipe from Cooking Light.